First Aid for Bikers courses. Yes, the big one is here!!! 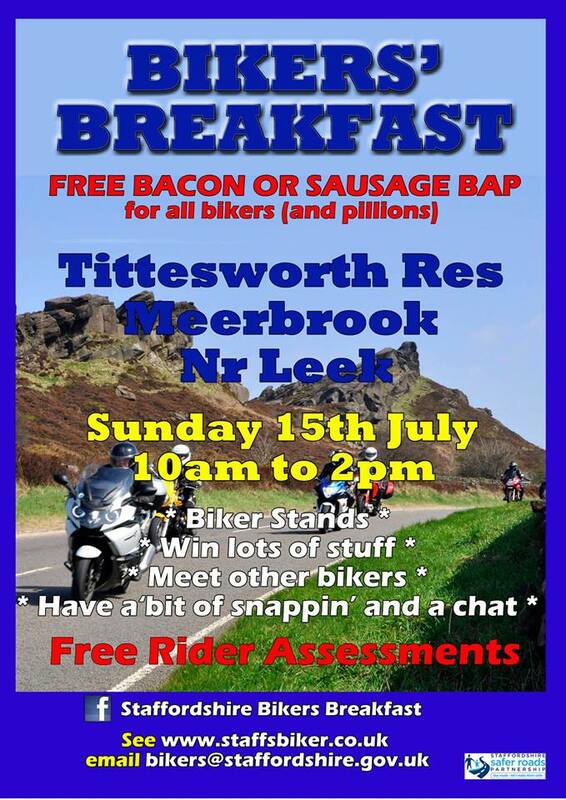 We had such a great response to last year’s Bikers’ Breakfast at Tittesworth Reservoir with over 750 bikers attending, the feedback was great, everybody loved the place. So we’re hoping you’d like to take a ride-out to see us on Sunday from 10am to 2pm which would be through some lovely Staffordshire scenery. We have lots of great interesting stands there with a few new ones including ‘Trials bikes from the 1950’s to present’ and everyone seems to be going to see Brian from the Police Forensics Team, so make sure you go there. We have the Buzzwire as usual so have a go to win one our exclusive ‘Think Bike’ mugs and we currently only have 9 entrants in the hat for the set of Michelin tyres, so make sure you have a go of our Highway Code quiz. We’re all raring to go this Sunday at the Tittesworth Reservoir Bikers’ Breakfast. I’m sure all that came here last year won’t miss this one it’s a lovely place and a great ride-out and if. We’re here from 10am to 2pm and we’re giving away free bacon or sausage baps as well. There’s lots of stands here with our Think Bike stand, IAM offering advanced riding opportunities, MAG helping bikers, Secure AutoTrack giving security advice, Taylor Brothers, CMA, BikeSafe and NABD will also be here. We have Gawsworth Jesters promoting Prostate Cancer charity and Solving Kids Cancer. Two new stands for this year are the Police Forensics Team and Staffs Moorlands Trials Club, both not to miss. We are offering first aid courses for bikers and Judy from TrainingAid will be demonstrating throughout the morning. Hope to see you there guys. « What happens to all the stolen bikes? Making the transition to bikes. Staffordshire Biker are a biker-friendly organisation made up of bikers, bike enthusiasts & volunteers from all over the Staffordshire area that help promote motorcycling in Staffordshire, organise events and plan initiatives for Staffordshire's locally based bikers and bikers from afar who would like to visit the area. Would you like to supply content for any of the pages on this website? Do you have any comments or think you can suggest ways of making this site better?